To provide opportunities for amateur musicians to perform and grow musically. To enhance the quality of life in Chatfield and the surrounding areas. We strive to give our members the experience of playing many types of band literature, while giving special attention to preserving the community band tradition. The Chatfield Brass Band, Inc. is a non-profit, 503c organization. Interested in playing in a community band? Become a member of the Chatfield Brass Band and discover the enjoyment of creating music in a stress-free environment. When you join the Chatfield Brass Band, you will find a group of musicians of all ages, from all walks of life, who come to band because they love music, love to play their instruments, and enjoy playing in a quality group that is fun and active. 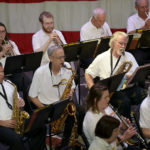 Band members hail from fifteen different communities, and the yearly schedule for the band includes a Holiday Concert in December, a series of “Concerts in the Park” in the summer, and parades and concerts in surrounding communities. Drop-ins welcome! If you are in the area and would like to join us for a rehearsal or concert, give Carmen a call. Rehearsals are on Thursday evenings at 7:00 p.m. in the Chatfield Elementary School band room. If interested, contact Carmen Narveson at 507.867.3315 or carmennarveson@gmail.com for more information. Member quotes: Why do you like being a member of CBB?